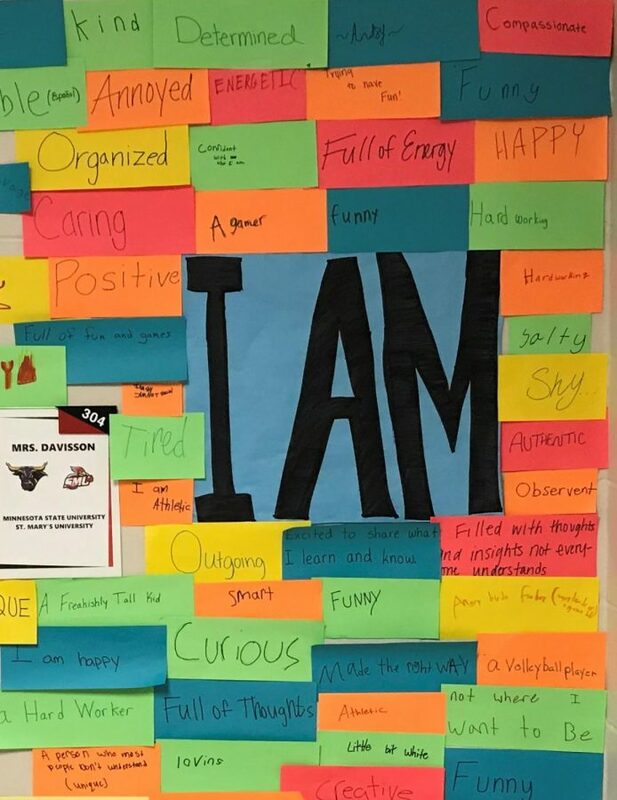 Middle school language arts teacher Mrs. Davisson created an outlet for her students to express who they are as individuals. Are you feeling happy, calm, optimistic, or even surprised? And if you are, do you feel the need to share it? If so, go to Mrs. Davisson’s room, take a slip of paper and write it down. The eighth grade language arts class has been learning about recognizing their identity and identifying qualities that they aren’t. The eighth graders started by recognizing things they are not and then changing them into things they are. The I AM wall is the final product of this. Mrs. Davisson set up the wall so that anyone who is feeling something (which is everyone) or think that they have a certain personality trait can write it down and Mrs. Davisson will post it on the wall right outside her classroom door. So that means if you are ecstatic because you got an A on your test, you can take a slip of paper, write down “happy”, and it will be hung up on the wall. If you just woke up and feel like you need a nap, you can write down “exhausted”. If you are just really bored and the world needs to know, you can write down “bored”. The slips of paper are completely anonymous and no one can judge you for what you have to say. Mrs Davisson says that she made the wall because she wants her students to build relationships. Seeing what others think of who they think they are can really help you learn to respect others thoughts and feelings, building a classroom environment of respect and trust. “What I want to do in this classroom can’t be done if people don’t feel safe”, says Mrs. Davisson “I felt like I needed to put time into building a relationship with the students and making them build relationships with each other before I started something solely academic”. A book called Upstanders by Harvey Daniels and Sara K. Ahmed gave Mrs. Davisson the idea to start the wall. She said that she knew other schools have done things like her I AM wall, so she pieced together ideas from her book and what other schools have done to build her creation. A big blue piece of paper with I AM written on it covers the center of the wall. The rest of it has already been almost covered in a wide array of colored papers that students have filled out. The I AM wall seems to be working well. Student Ryanna Karstens said “I think it is really interesting to see what other people think of what they are.” The wall is very entertaining to look at and read. Some of the slips of paper already up on the wall take a more positive note like happy, compassionate and kind. Some describe personality traits, including shy, organized, and positive. Of course not all of them are something you want to be feeling, such as angry, tired, and salty. Even if you don’t want to write down your own word to add to the wall, you can still come by and read a few. It might just make your day.